A California audience settling into a packed theatre to watch the family-friendly hit Finding Dory got quite a shock when an expletive-laden trailer for another animated movie, Sausage Party, by Canadian actor-filmmaker Seth Rogen, turned up onscreen. A California audience settling into a movie theatre to watch the family-friendly hit Finding Dory got quite a shock when an expletive-laden trailer for another animated movie, Sausage Party, turned up onscreen. The incident earlier this month at Brenden Theatre in Concord prompted an apology from the cinema chain. "Playing that trailer was a one-time honest mistake by a theatre manager moving screens around in an effort to accommodate several large, last-minute groups wanting to see Dory," Walter Eichinger, vice-president of operations for Brenden Theatres, said in a statement to U.S. media. "In the rush, one hard-working manager clicked the wrong movie. It was caught soon, but not until that trailer was played. We regret it, apologize for it and we are not happy that it happened. 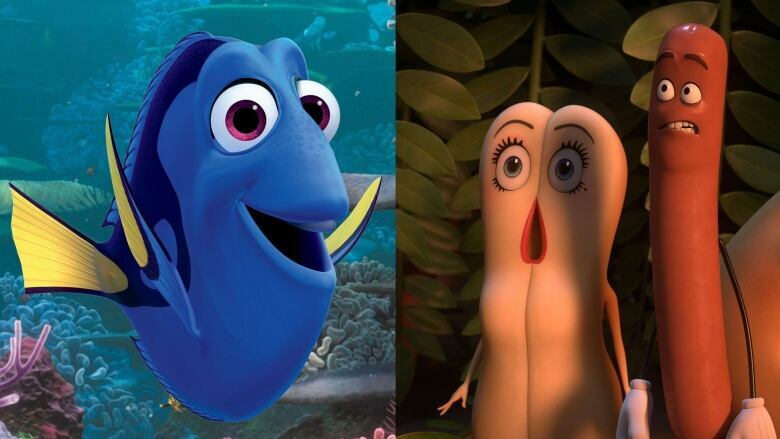 We fully realize that this trailer is not appropriate for Dory and we would never schedule something like that." Finding Dory is a PG-rated sequel to Pixar's earlier under-sea hit Finding Nemo. The tale of a fish searching for her family and home, Finding Dory has been a hit with families audiences around the globe since its release earlier this month. Sausage Party, slated for release in late summer and billed as "the first R-rated CG animated movie," follows a sausage that discovers the horror of what happens to groceries after they leave the supermarket. The animated film comes from envelope-pushing Canadian actor and filmmaker Seth Rogen — known for roles in Knocked Up, Pineapple Express and The 40-Year-Old Virgin, and as writer-producer on projects such as Superbad, The Green Hornet, The Interview and TV's Preacher. Rogen shared the story on social media, noting: "This made my day."